One of the more interesting aspects of big data are the novel insights that organizations can gather about their customers’ behaviors, tendencies and propensities, and how those insights can rewire an organization’s customer value creation processes. Your customers, through their interactions on the web, via social media sites and usage of their smartphone apps, are leaving their fingerprints all over the internet (see chart below). 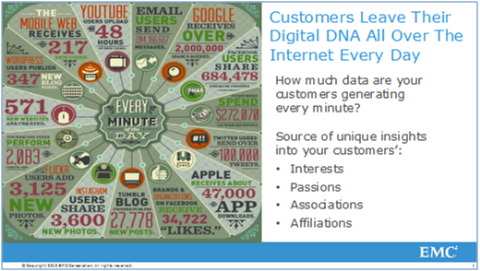 These fingerprints provide invaluable insights into their areas of interests, passions (areas of advocacy and promoter status), associations (the formal groups to which they belong) and affiliations (those causes in which they believe), and can be leveraged to improve every customer engagement point. Unfortunately, organizations don’t tend to think about the entirety of their customer lifecycle process, and many organizations have separate groups focused on spot solutions for areas such as acquisition, up-sell, and retention. Many organizations are fanatically focused on reducing churn within their existing customer base. It is estimated that it costs 10x more to acquire a new customer than it does to retain an existing one. The result is that organizations expend a significant amount of marketing, sales, and support resources in an effort to identify potential churn candidates and take correction actions early enough in the customer engagement process to prevent the churn. However, I’d challenge that an organization’s churn numbers are even worse than they think – that they don’t consider the money and time wasted in profiling, segmenting, targeting, and acquiring the wrong prospects, and the ineffectiveness and waste in making the wrong offers to the wrong existing customers. In reality, there is customer churn, or defections, at each step in the customer lifecycle engagement process (see graphic below). In order to “optimize” the entirety of customer engagement processes, organizations need to develop a deep understanding of their customer’s interests, passions, associations, and affiliations. Organizations need to integrate these new customer insights to drive critical financial metrics such as customer’s lifetime value (LTV) and customer’s likelihood to recommend (LTR). To do this, organizations need to become much more proficient at “instrumenting” each and every customer touch point, including social media, mobile apps usage, and human (sales and service) interactions. Organizations also need to embrace “experimentation” as a means to learn even more about their customers – to understand to which messaging, promotions, and offers they respond, and to which ones they do not. Organizations need to appreciate that every customer engagement is an opportunity to learn more about the customer, which ultimately affects the quality and relevance of the customer engagement and the long-term profitability of the organization. 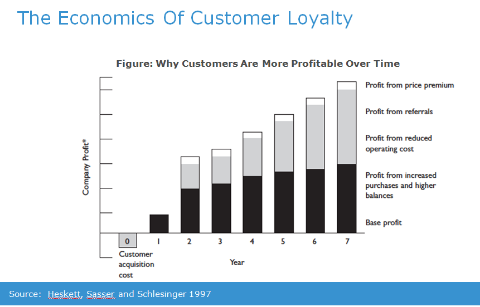 This implies that if you could “fire” the 75% to 90% of your non-profitable customers, you would not only increase profitability, but you would also dramatically reduce your overall cost structure for targeting, acquiring, and retaining unprofitable customers (see chart below). Organizations need to focus on reducing churn or “defections” throughout the customer lifecycle process. 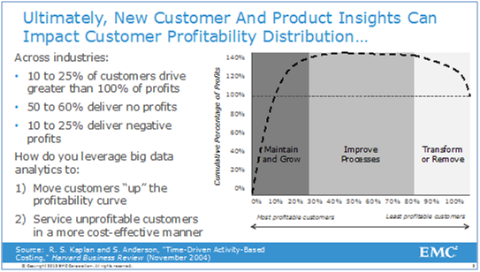 Instead of just focusing on reducing churn among existing customers, leverage superior customer insights to eliminate “defections” throughout the customer lifecycle process including areas such as profiling, segmentation, targeting, acquisition, maturation, retention, and advocacy. Superior customer insights will lead the organization to improve profiling, segmentation, targeting, and acquisition of the “right” customers based upon customer behavioral insights, tendencies, and propensities coupled with financial valuation metrics like LTV and LTR. 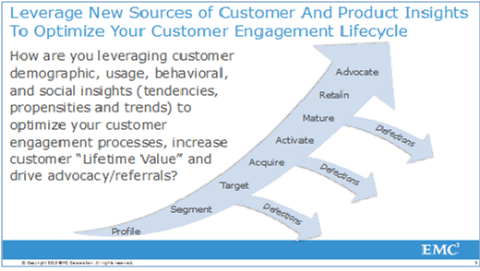 Having the right customers on-board and reducing defections throughout the customer lifecycle engagement process will ultimately lead to improved customer retention overall (see chart below). By the way, Jeff Kelly from Wikibon and I are presenting a webinar on Tuesday, April 16 titled “Create Your Big Data Vision and Hadoop-ify Your Data Warehouse.” Select on the link here to register. Hope you can join us!! Gathering customer insights can help you develop a great strategy in strengthening your support team which in the end will result to meeting your customers expectations.